A controversial proposal for a caravan park to be created in Trusthorpe has been recommended for approval at ELDC’s Planning Committee meeting tomorrow (Thursday). The plans, which relate to a site adjacent to North Road and Main Street, have been recommended for ‘approval with conditions’ by East Lindsey District Council planning officers - despite dozens of objections from neighbouring residents and Mablethorpe & Sutton Town Council. The land is currently a vacant arable field, and the applicant - Theddlethorpe man Rick Howell - is seeking consent for ‘change of use of land’ to allow it to be used as a touring caravan park. The caravan park would consist of 153 individual pitches, construction of vehicular and pedestrian access, car parking area, and internal roadways. However, the proposal has been wholeheartedly rejected by Mablethorpe & Sutton Town Council, in its role as an official consultee to the District Council. Town councillors cited loss of ecology access and highways issues; traffic generation; visual impact; noise and disturbance; crime; effect on conservation; health and safety; flood risk; overlooking and loss of privacy; and the cumulative impact of these negative factors combined. 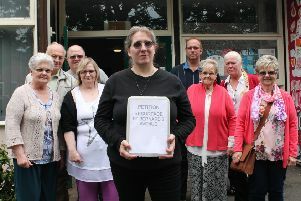 Additionally, there have been more than 40 formal objections from local residents - with many objections focusing around the abundance of caravan sites already in the village, and potential issues with drainage. According to the District Council, no formal letters of support for the proposal have been received from residents. One resident’s letter of objection to the Planning Committee stated: “My concern is that, if permission is granted, this will be a passport to future planning applications on the site. “When considering your decision, please look at the balance within this small area of Trusthorpe which is already well served with caravan sites. Another letter of objection aired concerns over the width of North Road and congestion during the summer months, and also stated: “Sufficient capacity exists locally for touring caravan sites. • Visit our website later this week or read next week’s Leader to find out the Planning Committee’s decision.